Home > Blog > Content Synchronisation – A Link Building segment of Off-Page SEO with 2017 updates! 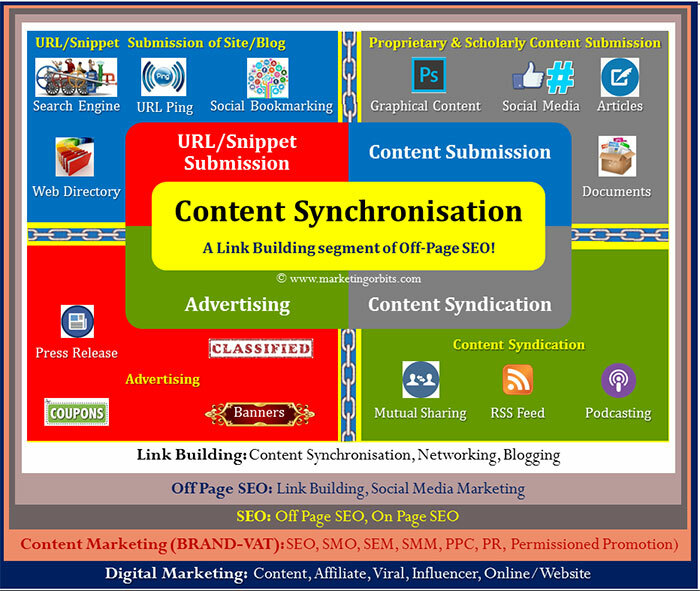 Content Synchronization is a branch of Link Building in Off Page SEO. To give it a grand pictorial visualization SEO further is a branch of BRAND-VAT (Content Marketing) segment of Digital Marketing. I have tried to depict the same in above textual image. Though we shall be discussing Content Synchronization throughout this article but let’s elaborate ‘BRAND-VAT’ a bit before going ahead. ‘Brand-VAT’ is attaining a flourished ‘Visibility, Authenticity and Trust’ of your Brand both online and offline. Our emphasis in this article shall be on its online part. My experience plus numerious research studies done say that it is not the number of backlinks gained rather the ‘Brand-VAT’ achieved that matters. And to achieve it, earning quality, valued and reputed backlinks is the key. Brand-VAT sets you as top knowledge source & authority in the market. Thus higher the BRAND-VAT so high will be the influence of your website. And that should in all cases be taken as the ultimate goal of Content Synchronisation. Now let’s have a look on what and how should be prepared before jumping into real time Content Synchronisation activities. Snippets consist of basic information of your business such as business name, logo, tag line, short description (ideally in one paragraph), address, phone number, email and website URL a minimum. Scholarly Articles around your business topics and/or events in textual as well as document forms such as Word, PDF, PPT, Infographics etc. You shall be setting a routine on it in later stages. Attention grabbing rich media visual and graphic content such as images, banners, coupons, offers, audios, videos etc. All types of the content should be of high graphic and lexical quality, focused, updated and relevant message giving. Having it all perfectly done will help in earning the high acceptance and authenticity for your Brand online; remember the ‘A’ of Brand-‘VAT’ described above it gets approval by abiding by these factors. Last but not least all sorts of content should be strong enough to impact the emotions of your target audience. Well it counts for most of ‘T’ of Brand-‘VAT’. With all or maximum of these pre-requisites met and as MOZ also says, “it is now for the real kick-start of online reputation building”. Synchronising the above said sets of promotion content through multilple channels (though manually) is called the Content Synchronisation. We shall talk about 15 such synchronisation segments categorized under 4 main categories in this article. It primarily deals with synchronisation of URLs and Snippets content set (see point one of pre-requisites section above). This is the start-up category of Content Synchronization activities with 4 segments under it and forms the base for others. Let’s talk these segments one by one. Website/Blog Submission on Search Engines: It is about manual indexing of your site on search engines. Google Search Engine is the most reputed among all and is a must to invoke very first indexing of your website. You need to have a Google Webmaster Account (access it with your gmail account) to submit your website or blog URL on Google Search Engine. Out of below given 4 sources, each provides a list of top ranked good quality search engines (including google) on which if your URL is synchronised, its authority and popularity will surge remarkably and will be noticed by maximum of online authorities and audience of your interest. As per Wendy Boswell at lifewire unlike web directories URLs submitted on search engines are maintained by spiders and softwares. This submission process may take from 1 to 5 minutes depending on your knowledge and internet speed. Website/Blog Submission on Web Directories & Yellow Pages: Directories provide your website or blog the quality backlinks. Although search engines have taken over directories today but they still hold their niche. Web Directories submission usually require URL or basic subscription information but according to techwalla some directories like ask.com require sitemap for submission instead of mere URL. When it comes to the publication time, for most of directories it is immediate but some like alexa.com takes 6 to 8 weeks in enlisting your submitted site or blog. Links submitted and accepted by web directories increase the credibility of your website in the eyes of Search Engines. Higher the number of quality inbound/back links your site possesses through web directories, so highly influencing and ranked it known to search engines. Web Directories are much smaller than search engines’ database. Web directories list websites by subject and categories, whereas Search Engines list them by ranking, relevance and authority on top. Web Directories are usually maintained by humans instead of software, whereas Search Engines listings are maintained by robotic calculations and software. New Content or Update Submission through URL Ping: It is not the one time submission on Search Engines or Web Directories and job done. Rather you need to synchronise your new releases or updates (not all but important ones) regularly or whenever you have through a specific activity called as URL Ping. Be it about informing your existing readers or attracting the new ones, time to time pinging of your new releases and updates maintain your trust among them. Some such most popular ping services are Google Ping and Pingomatic. Submission to these sources lifts your updates to almost all big search engines and directories worldwide. This Top 30 Ping Sources complies a good reference list for URL pinging. Be reminded that pinging your site or blog to these sites doesn’t guarantee you the high rank, because the quality of your content still holds the key. Pinging to credible sites just ensures you that your content will be crawled globally or at least considerably. Social Bookmarking: Having originated its conceptual root from personal bookmarking of a specific webpage in ‘FAVOURITES’ of your IE Browser (Firefox, Chrome, Opera, Safari etc. added later on) just for own, social bookmarking is about bookmarking your own website or blog on public web directories. End goal of social bookmarking is creating backlinks plus maximum visualization of your brand over social media platforms. One ironical truth of social bookmarking is that it is about working with second in genre of social sites. For example tumblr, digg, stumbleupon, delicious, diigo, myspace, hi5, technorati a few to name all of these line up behind top-noche Facebook, Twitter, LinkedIn, Google+, Youtube etc. of this field. Top 15 Most Popular Social Bookmarking Websites is a good list of all such popular directories, which you should not give a miss in this regard. The key points which determines your bookmarking mileage are the use of “#hashtag”, “tag” and/or “keywords” in anchor text as well as snippet to be submitted on bookmarking directories. These tactics help in mobilising traffic on your site. Interesting Synonyms of Social Bookmarking: Networksolutions.com enlists its synonyms quite impressively as, “Social bookmarking is also interchangeably sometimes referred to as folksonomy, collaborative tagging, social classification, social indexing, and social tagging. ‘Folksonomy’ is a combination of the words folk and taxonomy, hence a folksonomy is a taxonomy generated by a person or group of people”. Prime difference between URL Ping and Social Bookmarking: URL Pinging is telling the search engines and directories about your web content, while Social Bookmarking takes it into telling about the same to public. Research, quality, ownership, copyright and authenticity are the primary characters of this type of content, thus so is its name ‘Proprietary and Scholarly Content’. There are 4 major types of such content and their synchronisation illustraed as below. Article Submission: Publishing the articles or posts written on your business topics, events, products or case studies (insert the links for which you seek backlinks wherever appropriate) to garner good backlinks and high rank for your kewyords is known as article submission. Articles can be published in three most known ways. third by submitting them on directories in forms of DOCUMENTS. Our focus in this segment is on second one. Photo, main body text, comments permission and copyright declaration on second and final submission screen. Beside these, it provides option of inserting supplemntary caspules such as video, rating, poll, quiz, table, link, callout, map too. Once submitted publisher’ team will review it for any duplicacy. They will serve you with review notification if found duplicacy and unpublish your article until you won’t settle the notification. Repeated duplicate articles may cost you losing your membership at hubpages. These articles on semrush.com and bestseoadvise.com enlist pretty good quality article directories of both free as well as paid genre. Most of article directories allow you to insert backlinks in your article content. For example articlebase.com permits you to insert up to 3 backlinks. The value of a backlink generated through such directories is sometimes more than 100 ‘nofollow’ links. Such links helps our keywords and page both rank high. Article Directories also give attention to your article length, originality of content, its category and duplicity. An article of 300 to 1000 words is acceptable by most of directories; 500 words is taken as an ideal article size whereas YOAST SEO’ ideal size is 900 words. Documents Submissions: Riding on the similar purposes and benefits as of the article submission, document submission differs mainly on its submission format. Unlike textual submission in case of article submission, documents submission goes with submission of same content in file formats like PDF, PPT, Word etc. As creating backlinks is the main purpose of this method too, so you can easily insert those links for which to get backlinks in these documents wherever seem appropriate. After inserting the links we can submit the same document for example WORD or PPT file or can convert it into PDF; inserted links will carry in the PDF too. While choosing document directories, make sure that the chosen directory issues you a public link so that public would have access to it even without having an account on its host directory. Among the most popular and authentic document directories a few to name are issuu.com, slideshare.net and scribd.com. 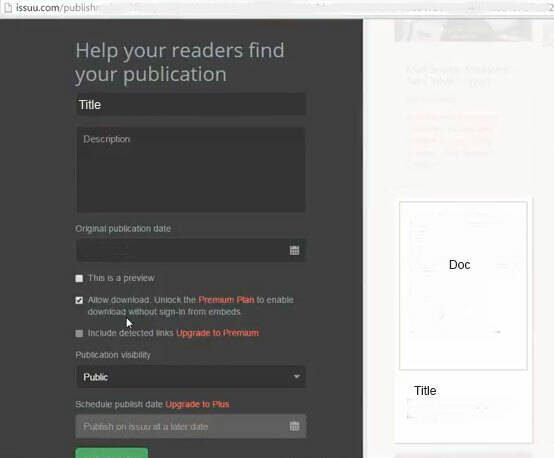 Below screenshot gives a glance of how submission screen of issuu.com looks and what information it asks for synchronising a document through it. visual.ly is a globally acclaimed (Domain Authority 81) platform which helps you in creating quality graphic content free of cost. coolinfographics.com is a read-worthy source about types of infographics. Social Media Submission: In simple words it is about publishing your articles, notes and posts on various top ranked social media sites such as Facebook, Twitter, Linkedin, Google+ etc. You can publish your content in two ways, one directly on your own business profile page on these sites, second on groups and pages similar to your business on same sites. Prime differences between Social Media Submission (SMS) and Social Bookmarking (SB): Where SMS is about submitting any content, SB is about submitting URL and Snnipets at the max. Secondly SMS talks of the whole of or the lengthy content, SB focuses on particular keywords only. The big difference between advertising and rest of the backlinks earning methods is that former is surging in nature with short life period, where as the other methods may last long. There are several advertising techniques since times known. Here we shall peep into some crucial to SEO advertising backlinks and PR earning methods. I see creating backlinks through advertising as an instigator technique more than any direct backlinks giver. It fuels the viewer to propel for a landing on your site, which may or may not last longer. Even that ad may or may not appear in the viewer’ search again, that much varying and short-lived is the nature of advertising. Reading the below 4 segments of advertising will help us in understanding it more clearly. Press Release: As you may traditionally be aware with this word; PRESS is usually related to media appearances. When it comes to SEO, press pertains to appearance on online media sites and web directories. Good or big changes, news or events, new product or service release around your business are the right moments to avail the maximum of Online Press Release Submisions. The additional benefit of online press release is that you get backlinks and somehow a measureable data around your press release campaign to assess your efforts. Importance and benefits of press release: Jayson DeMers at Forbes states that “Press releases are still beneficial for SEO, but their power and their nature are in the middle of a transformative shift.” Press release should be on priority only if you want to do Brand Awareness, Social Media Influence, to get referral traffic and increase your outreach. It may get you backlinks too but consider other better methods prior to this if your objective solely is earning the backlinks. From the historical perspective as per CNET analysis report introduction of Google Panda and Google Penguin brought a surge in the rankings of news websites and social networking sites, and a drop in rankings for sites containing large amounts of advertising. 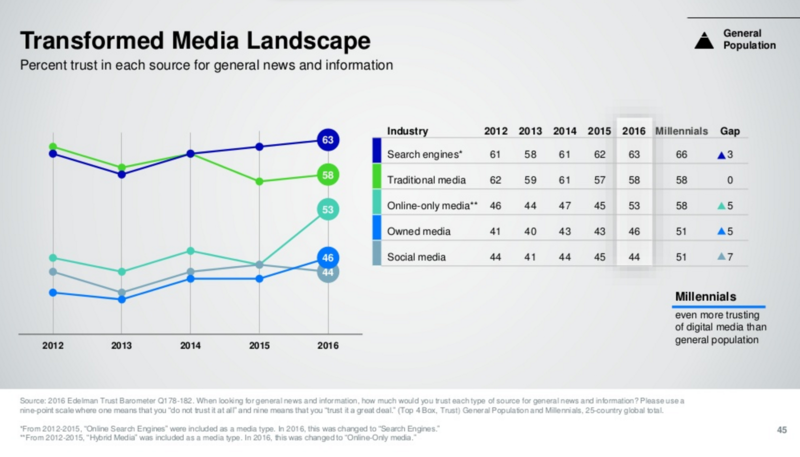 Below picture from CNET report depicts which search term pulled which media. 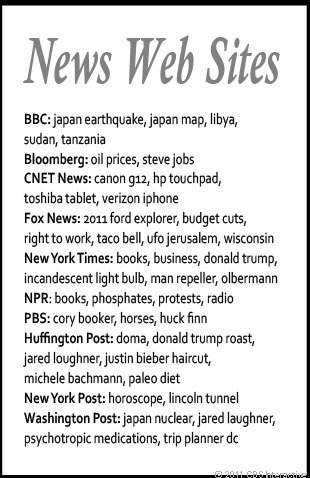 There are both free and paid press news submission directories. The Best Paid and Free Press Release Sites by Amanda MacArthur can be a good read before proceeding for press release campaign. According to Amanda, some reputed free press release directories are prlog.org, pr-inside.com, onlineprnews.com, pr.com, newswire.com whereas prweb.com, businesswire.com, marketwired.com, prnewswire.com are some high ranked paid services in this regard. Coupon Submission: Particularly articulated around e-commerce business, you can count it on for all sale/purchase segments of any business too. It helps your website to grab more online sale plus attracting surged web traffic thus visibility benefits. Online coupons usually come in two formats, one the number code coupons and second the promotion link only. RetailMeNot.com, DealCatcher.com, TechBargains.com, Groupon.com, Dealspl.us (Deals Plus), Coupons.com are some of the top trending coupon submission web directories. 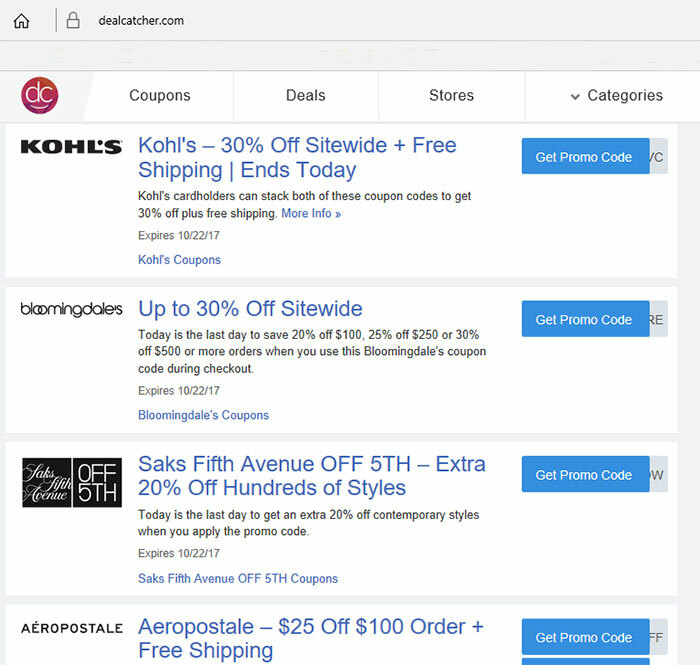 Below screenshot of DealCatcher.com gives a glimpse of how online coupon promotion looks alike. Banners: Banners are seen in three uses usually. First on homepage and category pages of own website, second in banner advertising and third as banner exchange. When I was working in a healthcare conglomerate company, I used to publish banners for their website display regularly. The purpose of such banners (and of course it still continues in businesses) can be taken as to get the site’ visitor acquainted with what new on site has been around by. Until this type of banner advertising was in practice there was least to do with online backlinks building through banners. But since the time same templates and display methods have been promoted to banner advertising and banner exchange platforms its power of generating backlinks can’t be ignored. Banner Advertising is perhaps the most used and popular method of doing paid and contextual promotion with intent of earning traffic, conversions and backlinks. Some highly reputed and most prevailing sources in this regard are google adwords, facebook advertising, twitter, and youtube. Banner exchange is done among ad exchange business networks to promote each-other’ banners through some dedicated platforms hosted at one common server. Click ratio, banner size and expected CTR are the biggest measuring factors behind banner exchanging. bannersgomlm.com, hit4hit.org, showyoursite.com and 5000banners.com are some of the fastest growing banner exchange sites. Classifieds: According to Wikipedia classified advertising is a form of advertising which is particularly common in newspapers, online and other periodicals which may be sold or distributed free of charge. This zone of content synchronization is bit tricky as most of viewers drive with intent of purchasing instead of searching something. So what is that then for which classifieds are meant for backlinking? Yes, that is the high ranking of that platform or classified directory on which you synchronise your classifieds. This listing adds value back to your site rank. Another benefit lies in classifieds is its capacity of exposing your ad to thousands of other website and/or people. Generally you require a snippet of title, description, url, photo, geo and/or personal details on most of classified directories for submission. Craigslist.com, leboncoin.fr, priceminister.com, ebay.fr, vivastreet.com, quickr.com are some of the most popular classified directories. Delhitrainingcourses.com enlists pretty good 90 classified submission directories with page rank and alexa ranking. In simple words of Neil Patel, ‘Content syndication is the process of republishing your content on third-party sites’. Podcast: There is a significant chunk of people who don’t bother to read your lengthy blogs or messages but would likely to listen to your audio or video message received in podcast. And as most of the podcasts provide option of submitting backlinks in the accompanied transcripts or descriptions thence that is where and how podcasts are a valuable source of earning backlinks. Also Wes McDowell at advancedwebranking.com states that by creating a podcast or being a guest on the audio creations of others you can reach an audience with a great amount of interest in what you have to say. And backlinks from related online profiles will get you the search engine love you need to make a noticeable difference. 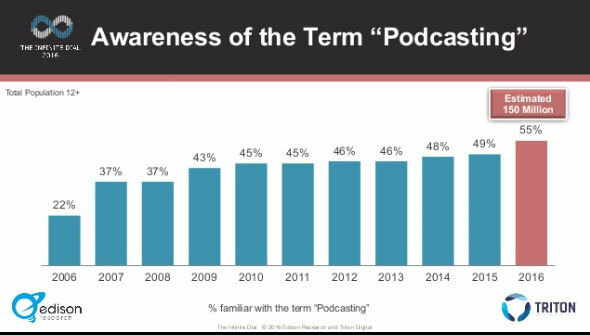 He also references study of Edison Research in same article according to which around a 150 million people worldwide are aware of the term podcast (see the below graph), which is significantly on continuous increase since 2006. So this number should be convincing enough for a smart marketer to synchronise their content through podcasting. Here is a list of some prominent podcast directories to synchronize your audio/video podcast series: For Apple lovers it is itunes, for android lovers it is Google Play and Amazon stores are some of the first in podcast genre. blubrry.com, podcastdirectory.com, podcastblaster.com, podcast-directory.co.uk and podcastex.com are a few to name in foray as second in genre. Beside it there are some dedicated to audio services podcasting providers too like last.fm, soundcloud.com, blip.fm, audioboom.com, mixcloud.com and spreaker.com are renowned audio podcasting channels to synchronise your audios almost free. For video podcasting, youtube and dailymotion are the biggest names. You can very easily create your profile on them and even can monitor your accounts directly with all traffic related figures recording and tracking facilities with ofcourse facility of generating backlinks in every description and transcript. RSS Feed Syndication: Until recent times, we have been understood to only one type of RSS (Rich Site Summary or Real Simple Syndication) Feed i.e. informing your clients about recent updates on your website or blog by an automated email sending system set on a particular time schedule. It is still in practice and is based on email subscription model i.e. permission based personal marketing into clients email box directly. Google Reader has been oen such most popular RSS Feed System. Now under the increasing influence and importance of social media, there is a further enhancement in it. It does the same activity with just replacement of ‘permission base personal marketing’ term with ‘public web directory submission’. Rest everything is same, same automated system, same scheduling features etc. 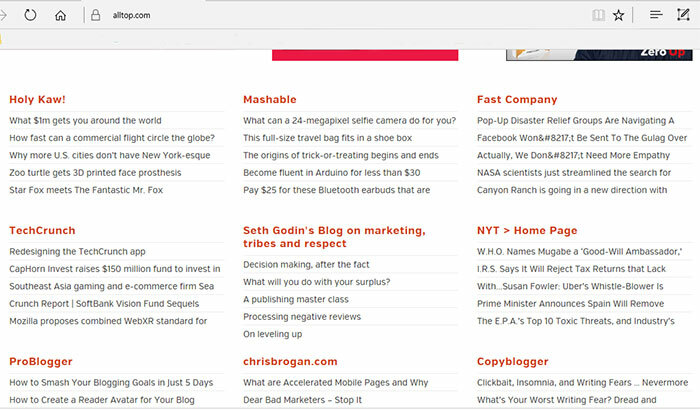 RSS Feed Syndication is similar to website/blog submission or even social bookmarking but with a big difference i.e. in former case we can syndicate multiple updates in one go whereas in later one submission happens at a single time. For example this screenshot of alltop.com shows how RSS Syndication works and looks alike. Toprankblog.com enlists some good RSS Feed directories for your potential use. Mutual Sharing: Content Syndication by mutual sharing is a kind of barter system in which you give this hand and take other hand. It is near to sponsoring also but in a give and take format, you publish their content and they do yours. But it should be done very precisely and strategically. Choosing with whom to barter, how, what and when to syndicate are key points of consideration before starting it. There are some thumb rules to apply like share only with those who have similar to your interest audience, higher than yours reputation and authority in market. On content part, the points mentioned above in ‘Content Readiness Pre-requisites’ will be handy in deciding what and how to syndicate. The prime issue here not to forget is that of duplicate or repeated content. This below chart from Eric Enge of searchengineland.com presents a good grip of understanding on how and what to prevent from being labelled as duplicate. Gaining backlinks through any of above talked methods are equally a matter of maintaining the balance between sincere and curiously blind efforts. 18 Types of Backlinks Violating Google’s Guidelines article can help you to maintain this balance. Content quality and contextual fit holds the key to ultimate authority. Sincere and honest synchronisations recommended. Don’t hesitate to consult an expert if finds any difficulty but don’t cross the line of balance as just talked in last stanza. Be selective while choosing submissions platforms. Last, but no least; don’t forget to send me your review plus feedback. I shall include the valuable ones in next version of this topic. Hi thank you for your remark, yeah sure I can you help you out; could you please elaborate your problem? Sure Palma, you can quote the content of MO in your said format with pleasure! Could you please elaborate a little bit what details in particular you want to know?